Have you ever watched the video with 8 people passing a basketball, where you're instructed to count the number of passes for the team in white? 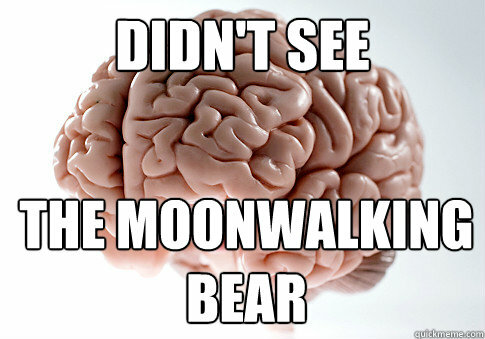 When your focus is on counting passes, you completely miss a bear who moonwalks through the center of the drill. When you watch again to see the bear, it seems impossible that you missed it the first time. But we often don't see what is right in front of us. When we expect to see something, our mind will focus on what we expect to see. If we don't expect to perceive something, we could very well miss it. This power of expectation and focus allows us to efficiently use our brains, but this efficiency often sets us on automatic pilot. Automatic pilot means we could miss change or difference. I have witnessed this happen in my private practice. I've sat with a couple in a session, and observed them bantering about a sensitive, hot topic. At one point, the husband looked at me and exclaimed, "See? She's doing it again! She was just trying to control me." I sat in front of them perplexed and honestly replied, "I don't see it." He expected to see a certain kind of behavior, and therefore he perceived it that way. Since I did not have expectation or emotional investment, I was aware of a range of nuanced emotions. As well, I've sat with a dating couple in a similar circumstance, when the girlfriend turned to me and exploded, "He doesn't care about me - he just said it!" I gently shook my head and said, "That's not what I heard him say. I actually heard him indicate the opposite." Often the individual is quiet and knows what I'm talking about, but isn't sure how to shift their expectations.